WHAT is a patent? It is a “legal monopoly” authorized by the Constitution and granted to inventors by the U. S. Patent Office. It gives inventors the right to exclude others from making or selling their inventions. How long does a patent last; can it be renewed? A patent is good for 17 years. It can be renewed only by a special Act of Congress but no patent has ever been renewed in modern times. You pay the Patent Office $30 when filing your application for a patent and another $30 when and if the patent is granted. An additional $1 is charged for each claim in excess of 20 claims. If you engage a patent attorney, the initial patent search may cost about $25. If your invention is patentable, and the attorney files the necessary papers, takes care of the drawings and follows through on your application until the patent is granted, average legal fees for a relatively uncomplicated patent will total $300-$500. 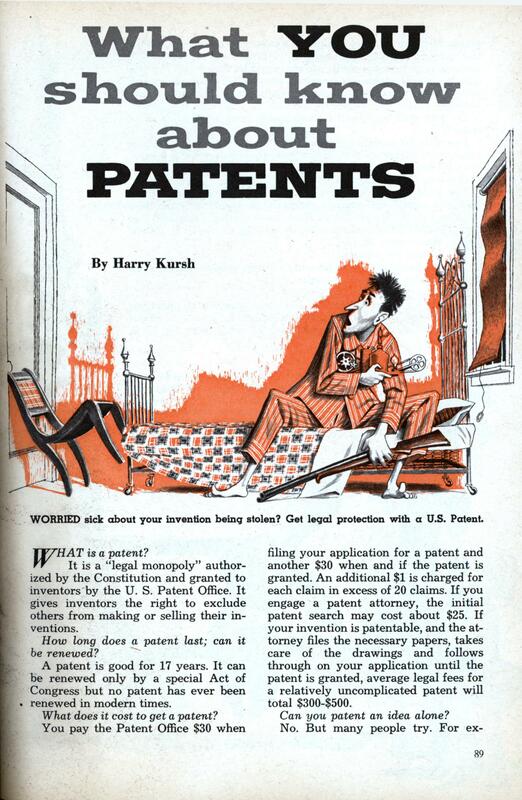 Can you patent an idea alone? Do you need to submit a model with your application for a patent? Requests for models are rare. But almost anyone who claims a patent for a perpetual motion machine is asked to submit a model. No such patent has ever been issued. Is it true that you can patent a plant? Yes. People who can reproduce a new plant—anything from a flower to a tree—can obtain a patent for their efforts. Some plant patents, like the Better Times Rose, have reaped a fortune. You can get plant patent information by writing to the U. S. Patent Office, Washington 25, D. C.
Can anyone get a patent? Yes. A person of any nationality, citizen or non-citizen, even prisoners, may apply for a patent. You file a written application. Standard specimen applications are published in a booklet called General Information About Patents, which may be purchased for 15 cents from the U. S.
Government Printing Office, Washington 25, D. C.
Can you file your own application? Yes. However, it takes a great deal of skill to write a claim that will stand up in court, in the event anyone should try to infringe on your patent. That’s why the most experienced inventors use patent attorneys or patent agents. What is the difference between a patent attorney and patent agent? A patent attorney is a lawyer who specializes in the field of invention. A patent agent is not a lawyer but he is recognized by the Patent Office as a person who is qualified to help inventors obtain patents. In this respect, an agent is just as good as an attorney. However, the agent would be unable to defend your patent in court. Before 1938, anyone who was a recognized patent agent could also call himself a patent attorney, even though he may not have been a lawyer. Such patent attorneys are still in existence, so be sure your patent attorney is also a lawyer if you feel you may need to defend your patent in court. What if I can’t afford a patent lawyer or agent? The Patent Office will assist you to be sure you have correctly filled in your application and filed everything in proper order. Can a corporation or business be granted a patent? A patent is never issued to a business or corporation. Patents are issued to individuals only. Can you select any lawyer or agent to handle your application? In a limited way. You may choose the man you want—but he must be registered with the U. S. Patent Office. Any lawyer or patent agent who is not registered cannot handle your application. Write to the Patent Office in Washington and ask for a free roster of registered attorneys and agents in or near your hometown. You can also purchase the roster of all the registered practitioners in the U. S. It is called Register of Patent Attorneys and Agents, costs $1 and can be ordered from the Government Printing Office. Can I complain to anyone if I feel a registered attorney or agent has not handled my case properly? If you feel you have been unfairly treated by a registered patent practitioner, you can submit a written complaint to the Patent Office and an investigation will be launched. Who will decide whether I get a patent? The decision is up to a patent examiner. There are over 2,000 of them in the Patent Office. Each is a highly trained engineer or scientist. Many are also lawyers. When your application is received at the Patent Office it is assigned to an examiner who may be an expert in your field of invention. If he turns your application down, you have the right to appeal to a special three-man board in the Patent Office; if you lose your appeal, you can take your case into the Federal Courts. How do I know someone in the Patent Office wont steal my invention? In the entire history of the Patent Office, a period of more than 150 years, only one case of dishonesty has been uncovered. That was at the turn of the century when a patent examiner merely tried to help an undeserving inventor obtain a patent. The examiner went to jail. No one working for the Patent Office is allowed, directly or indirectly, to obtain or own an interest in a patent unless it is by inheritance. Will publication of my idea in a newspaper or magazine endanger my chances of getting a patent? Under the law an invention must be new. This means if it has been published anywhere, in any language, longer than one year prior to date of application, that patent application may be rejected. The one-year rule makes allowances for scientists and researchers who want to write about their findings in professional journals, without losing their patent rights. Can I protect my ideas by sealing them in a registered letter mailed to myself? Whenever there is a conflict between inventors regarding who was first, the registered letter method is rarely treated as admissable evidence in court because it is considered self-serving. How do professionals protect ideas? Most of them make what is known as a witnessed disclosure. They describe their ideas as completely as possible in writing, including sketches. Then they get two people to sign a dated statement saying that they have witnessed and understood the invention. In the event of conflict, the witnesses may be called to testify under oath and this is considered reliable evidence. Many professionals keep a log in which they regularly record the progress of their inventions. They then have witnesses sign the log. The best protection, however, is to file an application for a patent as soon as possible. Can you get a patent but keep the actual working of your idea a secret? No. Every patented invention must be based on a full and complete disclosure of your ideas. Also your application must state clearly and fully how your invention works. What’s the best way to be sure my ideas are patentable? The first and most important step is to conduct a search among similar inventions already patented. No matter how long ago a patent may have been issued on an idea similar to yours, chances are you won’t get a patent. Most reputable patent attorneys and agents won’t file your application until they have had the files searched in Washington, where all patents are filed in more -than 30,000 different classifications of invention. The search room is open to the public and a staff of Patent Office experts is always on hand to help newcomers go through the files. It tells the public that you have applied for a patent. In this way, you can put your invention on the market prior to actual patenting and discourage others from stealing your ideas because if and when a patent is issued you can sue them for infringement. If your patent application is passed, can they still refuse to issue a patent? Yes. If the Patent Office deems that any part of your invention is useful to the Armed Forces, it may be classified Secret and you may never get a patent until it is declassified. For example, a scientist was recently awarded $340,000 for an invention he proposed in 1941. It is still in use but the government refused him a patent because of security reasons. Will the Patent Office help you protect your patent? No. Whenever you feel someone is making illegal use of your patented invention, your only recourse is to sue in the Federal courts. But if you lose your case, you can lose your patent. Do you have to go to Washington to apply for or obtain your patent? No. All dealings with the Patent Office must be in writing. The patent is mailed to you after you have paid the final fee. Is it absolutely necessary to have a patent before you begin manufacturing? You can manufacture your invention any time you please. But if you do so without a patent, you run the risk of losing all your ideas to competitors. Another good reason for patenting is that not all inventors do their own manufacturing. Many simply sell their inventions outright, or they sell manufacturing licenses for a percentage of profits, called royalties. Without a patent you have nothing to sell. In fact, most businessmen won’t even consider your ideas these days unless you can show that you have applied for a patent. A US patent comes with a fancy cover… colorful ribbon and seal, and currency-style engravings. Is it legal to reproduce the cover of a patent for publication in a book or article? I know that if you reproduce currency, the copy must be either smaller or larger than actual size. Any similar rules for the patent cover? said he got hardly any money from them? beesquare: You go to a blog about old magazine articles to get legal advice? It would never occur to you to ask the Patent Office? 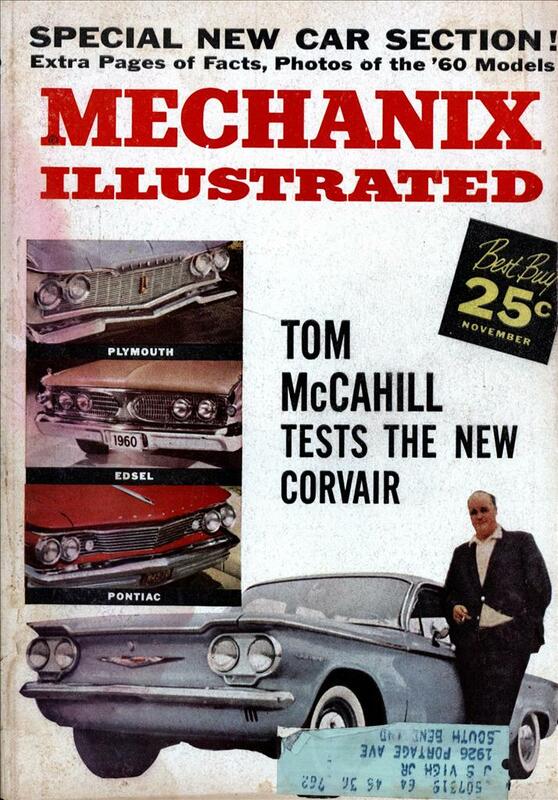 I went where Google took me… glad I did because as a result I found this terrific modernmechanix site. Patent office site was next, no definitive answer except that it is forbidden to reproduce their seal. beesquare: The link should have taken you to the contact page so you can e-mail them your question.